Spring, Easter, the Flowers of the Riviera, its mild climate, the treasures of the Ligurian hinterland, a Sommelier and Travel Guide. What's missing? Just YOU. 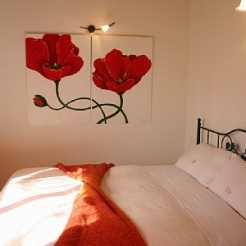 Easter Offer: rooms with bathroom and garden and breakfast: 2 pers. From 160 eur for two nights (3 days) Apartment with panoramic terrace 2-3 pers. 2 x130 eur with breakfast and linen. Appartam for 4-7 pers from 75 eur for each pers for two nights with breakfast. Restaurant service Easter45 eur, weekend 32 eur, evening Dinner 35 eur tasting menu. Relax massage 60 eur for 60 min.